Dr. Smith is a 1995 graduate of the University of Missouri College of Veterinary Medicine, has been with West Branch Veterinary Services since March 2003 and has been our owner since January of 2010. Originally from Spring Valley, Ohio, Dr. Smith has lived and practiced throughout the Midwest and Midsouth. He currently has two English setters with whom he enjoys exploring the woods of northern Michigan and a cat whose hairballs he does not enjoy. Dr. Smith enjoys golfing (POORLY), working in his yard, live music, cross country skiing and snowshoeing, and a variety of other outdoor activities. 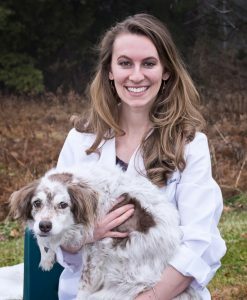 Dr. Sara Stein is a 2018 graduate of Ross University School of Veterinary Medicine, she completed her clinical year at Michigan State University. Sara grew up in metro-Detroit and received her cosmetology license in high school, putting herself through undergraduate school at Macomb Community College and Northern Michigan University while working as a hair stylist. While at Northern Michigan University she competed on the archery team, worked at Gwinn Sawyer Veterinary Clinic, and helped out with the Michigan UP 200 sled dog race. Sara and her husband, William, are avid movie goers. They have a dog, Luna, and a cat, Willow. In her spare time she enjoys horseback riding, dancing, and many outdoor activities. Tina has worked in the veterinary field since 1991. She is a 1996 college graduate and continues to attend meetings, conferences and workshops in the veterinary field. She currently shares her home with her husband, Matt, their three dogs (Titus, Zima, and Hooch) and their two cats (Lightening and Cointreau). Tina loves the veterinary field and all of the great clients, patients, friends and colleagues she has met over the years. In her free time Tina enjoys reading, traveling, hiking, watching movies, listening to a variety of music, spending time with friends and bike riding. She is very proud to have a job that she loves in a field that has given her so many great people to work with and for. Diane has worked at West Branch Veterinary Services since April of 2000. She previously lived in the metro Detroit area and worked 18 years as a Licensed Veterinary Technician. Since being at WBVS she primarily works the front desk and fills in as a technician. In the veterinary field she has worked with all kinds of animals including wildlife, reptiles, exotic birds along with farm animals and house pets. She lives on 20 acres and enjoys vacationing, being outdoors, gardening and her assorted variety of pets. Roxanne has been a receptionist at WBVS since 2006. Her previous work experience has been in management in the human medical field. Just prior to coming to work for West Branch Veterinary Services she lived in Florida where she and her husband owned and operated a laundromat for eight years. Roxanne enjoys gardening, cooking, concerts, and touring the countryside with her husband. She shares her house with her husband and three cats (all of which she adopted since working at WBVS). Kelly has always had a love of animals and enjoyed many pets over the years, from gerbils to horses. Kelly began working in the veterinary field in 1996 in Traverse City. She then moved to the West Branch area and has been with West Branch Veterinary Services since 1997. Kelly is currently one of our receptionists but has worked almost every position in our practice. Kelly has fostered pets through the Ogemaw county Humane Society before a shelter was built. She is currently married and has 3 dogs and 1 cat. Kelly enjoys almost everything outdoors, especially camping, hiking and running. She also loves to read and travel. Jenna joined our team in September of 2018, she is a West Branch native and we are thrilled to have her on our team. Jenna has a wonderful large mixed breed dog named Pete and works as a receptionist and a veterinary technician assistant. 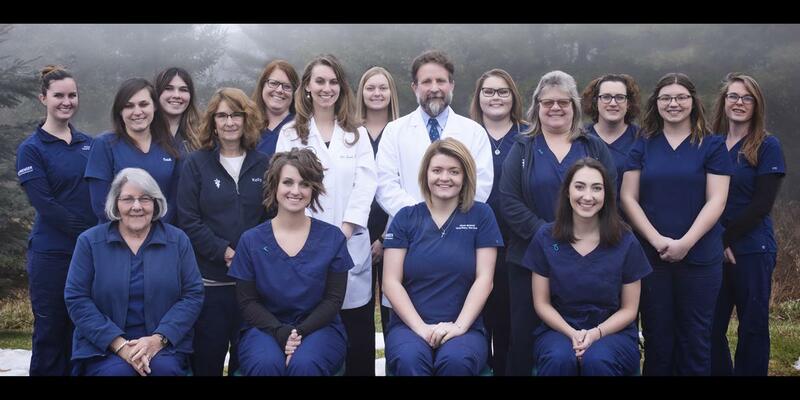 Randi has been working with West Branch Veterinary Services since June of 2015. Randi is a Baker College of Cadillac graduate with an Associate of Applied Science degree. She is one of West Branch Veterinary Services 3 licensed veterinary technicians. She currently shares her home with Pocahontas a DSH, a shepherd named Akela, a dog named Maleficent, & Meeko a Bengal Mix. When not working Randi enjoys reading, writing, music, hunting/fishing, horseback riding and many outdoor activities. Danielle graduated from Globe University-Wisconsin in 2014 with an associates of applied science. She then took her veterinary technician nation exam in 2015 to become an LVT and has been working in the veterinary field since. Originally from Bay City, MI she has recently moved to the West Branch area. She has a love for giant dogs, and owns a Great Dane, named Finley. Danielle's favorite thing about being a veterinary technician is cleaning teeth, during dental procedures. When not working she enjoys baking, being outdoors, walking, boating and snowboarding. Randi is a 2011 Houghton Lake High School graduate and a 2015 Michigan State University graduate. Randi is currently one of West Branch Veterinary Services veterinary assistants and has been with our practice since October 2015. Randi had volunteered in the veterinary field previously, worked at MSU's veterinary teaching hospital and also volunteered with The A.R.K. Wildlife Rescue and Rehab facility in St. Helen. Randi currently shares her home with a very cute beagle named Jessie. Sarah graduated Ogemaw Heights High School in 2014. Sarah is currently attending Mid Michigan Community College with plans to transfer to Michigan State University's Veterinary Medicine program. She currently has 3 dogs, 1 cat, 1 hedgehog, 3 horses, 9 snakes and 1 turtle. Sarah enjoys reading, horseback riding, sleeping, drawing, netflixing, fishing, music and playing music. She is originally from Flint and she and her family currently reside in Rose City. Sarah has been a wonderful addition to our team and has been with our practice since 2016. Taylor is currently attending Michigan State University where she will graduate with her bachelors of science in veterinary technology in May 2019. Taylor grew up in Glennie. She received her cosmetology license in high school, and then her associates in fine arts from Alpena Community College before attending Michigan State University. While at Michigan State University she competed on the stock seat equestrian team, and worked at the Michigan State University Beef Cattle Teaching and Research Center. Taylor is a lover of all animals. She has a dog, a parrot, two horses, and a crested gecko. In her spare time she enjoys riding her horses, camping, and painting. Rita has been working in the veterinary field since 1997. She graduated vet tech school in 2005 and then was a stay at home mom from 2007-2015. In 2015 Rita then when back to work at a general practice/emergency/referral hospital. She is new to Michigan and we are thrilled to have her and her very compassionate personality at our hospital. Rita enjoys reading, camping, archery, and playing music. She also loves spending time with her husband and her two daughters. Rita currently has a dog, a cat, and a crested gecko. Sara graduated from Ogemaw Heights High School in 2017. She did a semester at Lake Superior State University and is currently attending Kirtland Community College. Sara has 1 dog, his name is Moose and he is a boxer. In her free time she enjoys being in the outdoors, hiking, and hunting. Sara started with West Branch Veterinary Services in April of 2018. Allyson joined our team in the fall of 2018. Allyson currently works as a kennel attendant and shares her home with a menagerie of pets.